This stylish Sunseeker Predator is a head turner. Uniquely styled. Thoughtfully crafted. A Predator will never go unnoticed. 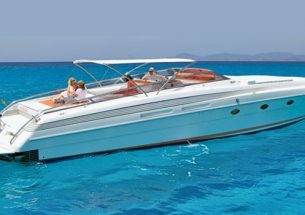 With large sunbathing areas both to the front and rear, this Sunseeker Predator is perfect choice for exploring the stunning Ibiza and Formentera coastlines. Her spacious cabin and interior carpeted lounge areas with air conditioning are great for socialising. Choose your own music & plug into the chunky 1500W sound system via USB. 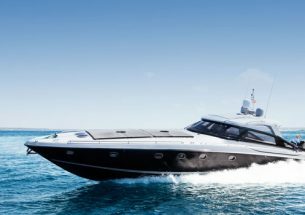 Take advantage of this beautiful motor yacht’s retractable sunshades, freshwater shower and bathrooms. Also boasting a fully ﬁtted kitchen, plush carpeted interior lounge and exterior wet bar. 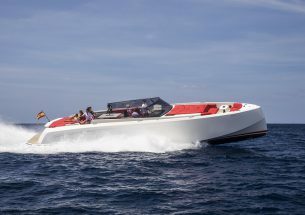 The price includes captain, beer, wine, water & soft drinks, towels, mooring in base port, full insurance of the boat and personal accident insurance.